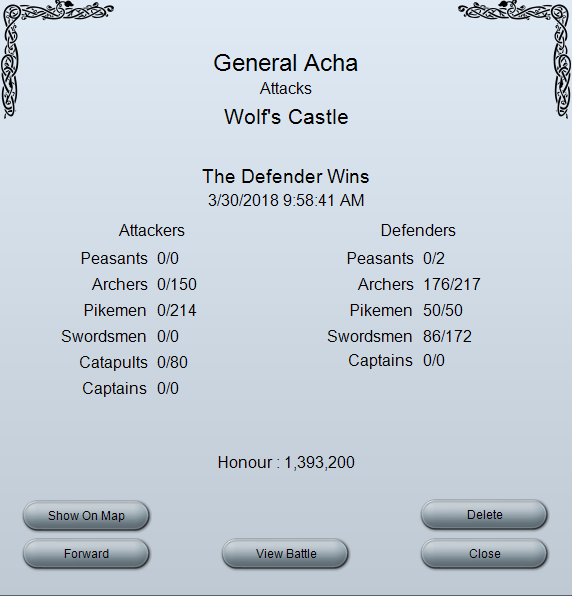 The Battle Results also have 3 less Swordsmen and 1 less Archer left defending the castle compared with the Report. I'm kinda glad this happened on a Wolf's Castle and not when capturing a human player. Is this a known bug which can be fixed or prevented? You're forgetting that SHK is buggy and FF either don't know how to fix the issues or can't be bothered. Having said that....I would be surprised if it happened against a real player but, could be wrong! I'm starting to get used to that problem, happens with like every fifth report on the wolf world. Absolutely impossible to improve your formations like this. It happened against a real player for me as well, back on GC1, but that's really rare compared to the wolf world..